That’s why industry experts are watching where carmakers, automotive suppliers and technology companies decide to launch autonomous car fleets. They say companies that successfully roll out robotic cars in congested cities prone to extreme weather will send a strong signal as to who’s leading and who’s playing catch-up in developing the cars of the future. Ford Motor Co. has test vehicles in Ann Arbor, Dearborn and Pittsburgh, three cities with varying degrees of pedestrians, bicyclists and cars — and challenging winter weather. General Motors Co. tests in urban San Francisco, Phoenix and Warren, cities with a range of street-level situations — and in one case, bad weather. With market leaders using different benchmarks internally to measure autonomous vehicle success, it makes it hard for consumers and investors to pick a leader in the short term. What matters most: the number of miles driven — in which case, Google’s Waymo is ahead of the pack — or the conditions under which the cars drive? 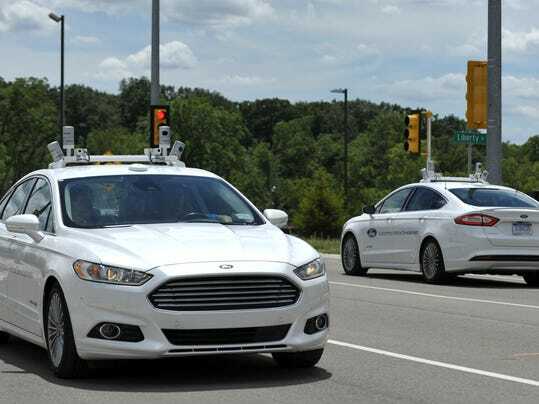 “Anyone calling it, they don’t really know, because it’s really hard to know,” said Michael Ramsey, who follows trends for connected and autonomous cars for the Connecticut-based Gartner research firm. “How would you go about comparing the capabilities of these vehicles side by side? It’s not even possible. French automaker PSA Group earlier this year announced it would partner with NuTonomy, a Massachusetts startup owned by Delphi spinoff Aptiv, to test self-driving Peugeots in tropical Singapore, one of the most congested cities in the world. Meanwhile, Waymo, the Google spinoff that boasts of having driven the most test miles, only recently announced it would test self-driving vehicles in Novi. Until now, Waymo has spent most of its time testing in the relatively unchallenging weather of suburban California, Arizona and Austin, Texas. Those test locations matter. Some automakers are less than three years away from planned delivery dates for their first-generation autonomous vehicles. GM plans to have a fleet of self-driving vehicles for public use by 2019. Ford officials say its autonomous vehicles will be road-ready by 2021. Waymo recently moved drivers from behind the steering wheel as a clear signal that its Chrysler Pacifica test vehicles are piloted by robots. Toyota, Nissan and Daimler are developing their own systems. As deadlines approach, the companies that run these vehicles with passengers in places that don’t have perfect weather all the time could prove themselves leaders. There’s also a chance to pull ahead for the group that launches in a dense urban area first, as that signals software capable of “reading” a street as well or better than a human. Simply put: More unpredictable things happen on the streets in a dense city than on a suburban road or highway, and a more advanced system is needed to “see” and interpret that input. On an almost-weekly basis, companies announce what they hail as cutting-edge or industry-first developments. Much of the reported progress is ambiguous. That has experts divided on how to determine a current leader, as Wall Street investors and consumers grow impatient with the unreliable flow of information. In the coming months, actions will speak louder than words, industry observers say. “The easiest thing would be to say who comes out with an autonomous vehicle first,” said Lionel Robert, a University of Michigan professor researching how humans interact with robotic vehicles. “What you have to really look for is the testing. Who’s actually running tests on the road? Waymo said in late November that its self-driving fleet had traveled 4 million real-world miles, which led some to declare the Silicon Valley company as a temporary leader, if only by a narrow margin. But numbers on the odometer matter little without additional information, Abuelsamid said. It’s more important to know what kind of weather the vehicles have tested in, and what sort of driving scenarios. A less reliable yardstick of progress is from computerized test simulations, which means the vehicle the software is meant to control isn’t actually moving. That makes it hard to determine which company is leading the pack. Moving forward, analysts want to see what kind of perfect maneuvers these vehicles are capable of making — and how often. That’s been the focus at Ford and GM. Ford doesn’t look to miles-driven as a way to monitor progress, said spokesman Alan Hall. GM has said its self-driving vehicles will cover 1 million miles per month by early next year. Both companies prefer to focus on the situations the self-driving vehicles have “solved” on the road, such as turns, lane changes, passing — and coexisting with construction zones, emergency vehicles and other obstacles. As pressure mounts for companies to deliver results, experts are slightly more confident automakers have an edge over technology companies and automotive suppliers in the long-term. Autonomous technology is only a piece of a complex puzzle that’s the new automotive industry.